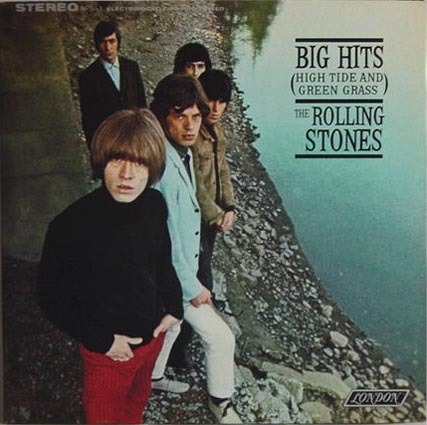 Big Hits (High Tide and Green Grass) is the first official compilation album by The Rolling Stones, released on 28 March 1966, on London Records in the United States and on 4 November 1966, by Decca Records in the United Kingdom. The two releases featured different cover art and track listing. The front cover for the American release was used for the rear photo on the UK edition. Reaching #3 on the US charts, where it remained for two years, Big Hits (High Tide and Green Grass) proved to be a big smash and currently remains a popular Rolling Stones retrospective. The UK Big Hits (High Tide and Green Grass) includes tracks released after the American edition appeared. The Rolling Stones' debut 1963 single, a cover of Chuck Berry's "Come On", was included, but its more successful follow-up, "I Wanna Be Your Man" - composed by rivals (although in reality as friends) Lennon/McCartney - was left off the album. Big Hits (High Tide and Green Grass) reached #4 in the UK charts. The album has been out of print in the UK for years, although it was officially released on CD in Japan for a time. In August 2002 this US edition of Big Hits (High Tide and Green Grass) was reissued in a new remastered CD and SACD digipak by ABKCO Records, with the British version remaining unavailable. The re-release contains stereo mixes of "(I Can't Get No) Satisfaction", "Time Is on My Side", "It's All Over Now", and "Heart of Stone". Noteworthy for the first album appearance of "19th Nervous Breakdown" and the hit version of "Time Is on My Side," this first collection in a long line of Rolling Stones retrospectives collects the early singles of a band that was slowly and surely becoming the World's Greatest Rock & Roll Band.